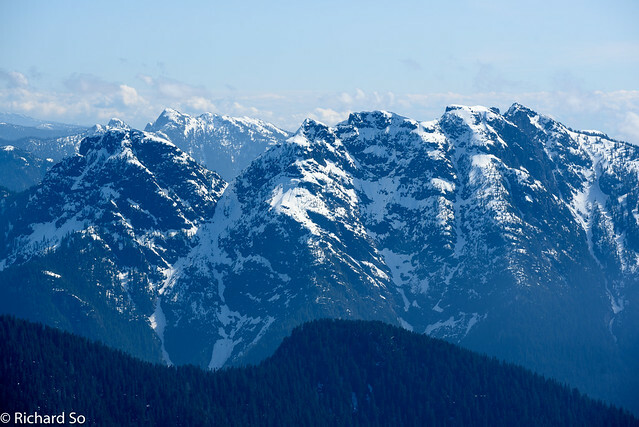 Last year, Alex Maddy and I hiked the Howe Sound Crest trail, from Porteau Cove south to Cypress Mountain at the end of May. That was an exceptionally dry year. We were in running shoes and only came across one snow patch to re-fill our bottles. 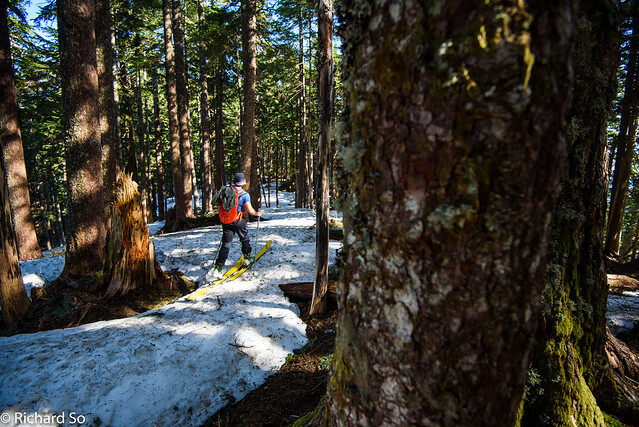 This year, the North Shore ski areas have seen a normal snowpack. 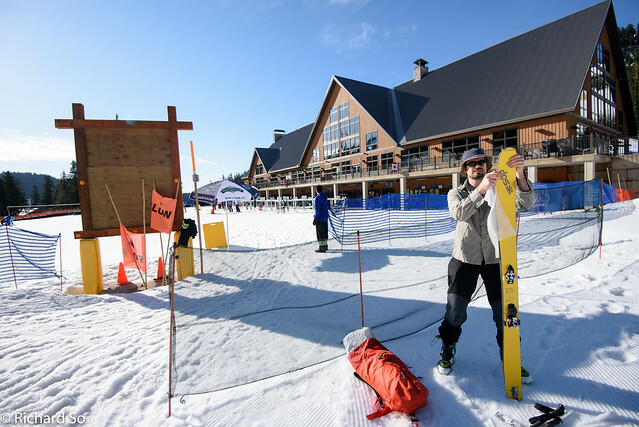 It's early April and all three ski hills are still open. 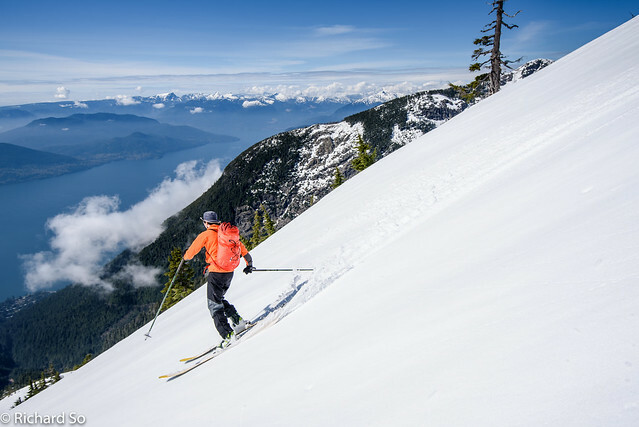 I've spent a ton of time skiing on the North Shore, skiing on Hollyburn and Seymour for regular meetings on the North Shore Ski and Beer Club in December and with the Vancouver Adaptive Snow Sports on Cypress and Grouse from January to March. Bone dry in late May. This year will be different. It's hard to believe, but there is snow on the North Shore! A photo from Seymour in mid-December. 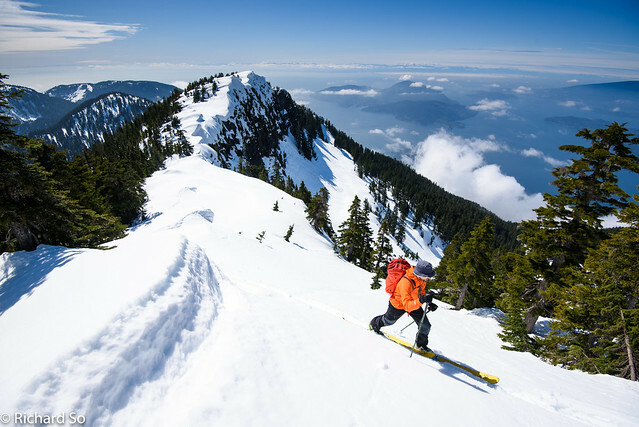 I've been meaning to do the ski tour along the southern half of the Howe Sound Crest trail before the snow melted away. One of the problems with this trip is that you can't start until 9am. Steve Jones does an excellent job of explaining the situation up at Cypress in this article. This isn't a big deal if you're just looking to head into the Yew Lake area, or wander over to the Bowen Lookout to catch the sunset or a mid-day hike up Black Mountain. 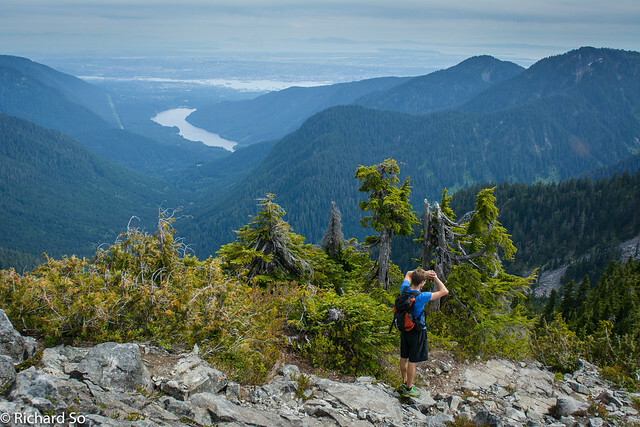 But if you're looking to tour out to the Howe Sound Crest trail, a longer distance in rugged terrain, starting early is key. 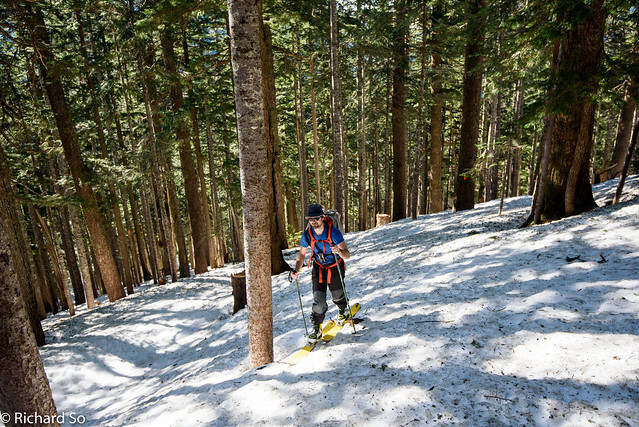 In the winter, days are short and you'll probably need a headlamp to descend the Lions trail. 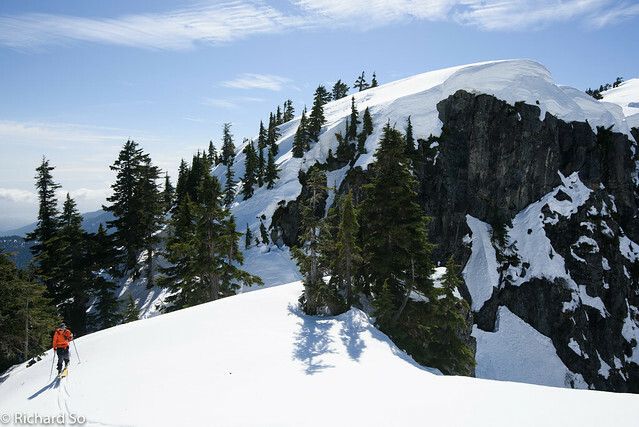 In the spring, starting early is key to minimizing the avalanche hazard from loose wet avalanches as the sun heats up the snow slopes. 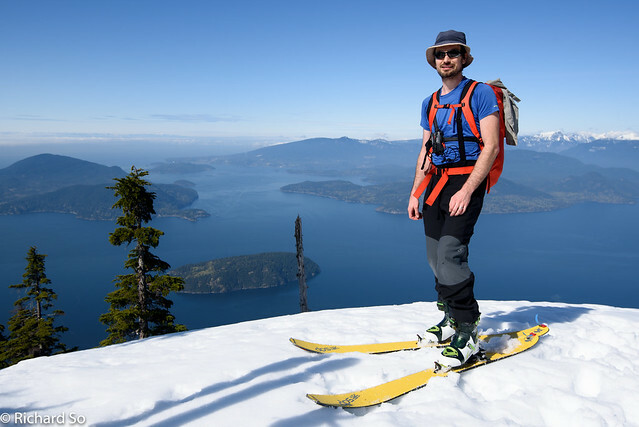 With the warm spring sun on this April day, I was expecting to encounter some slushy conditions but hoped that our descent wouldn't get too slushy,as the west facing slopes into Lions Bay would catch the sun later. It was just Mark and me for this trip. 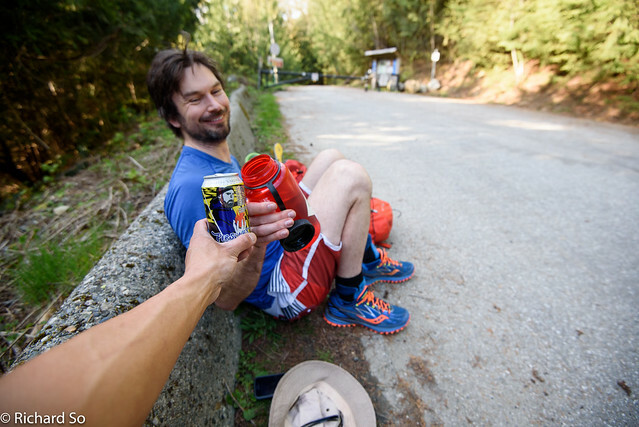 We made sure to pack our trail shoes at the bottom of the pack for the walk down to Lions bay. I left my car at Caufield and then Jen drove us up to Cypress Mountain. The plan was to catch the bus back from Lions Bay, which terminates at Caufield. 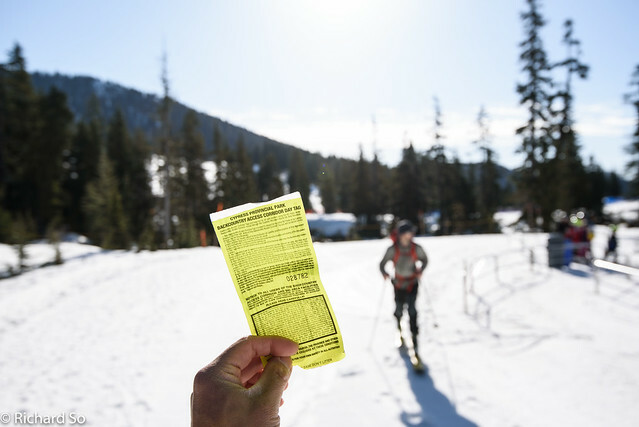 I have never picked up the free yellow Backcountry Access Corridor ticket before. You just walk into the Brown Bag Room at the Cypress Lodge (old one) and pull a ticket off the spool. 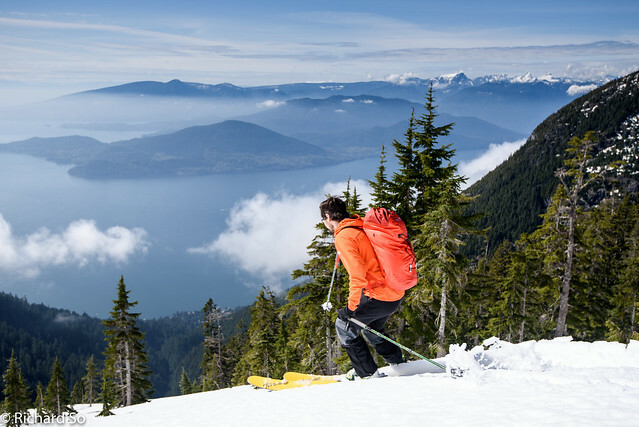 The fine print on the ticket describes all the potential hazards one could encounter at Cypress Mountain, like getting hit by a new skier/snowboarder, the constant rains that soaked through both of your Goretex jackets or running into pineapples. So grabbed the ticket, walked over to the ski area entrance, showed our ticket to the attendant, took a deep breathe and entered the danger zone. 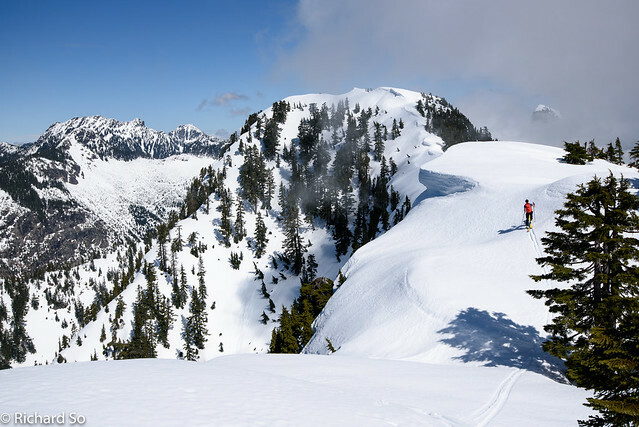 The next 150m from the gate to the Yew Lake area, behind the Eagle Express chair, consists of some of the gnarliest terrain you can find on the North Shore. 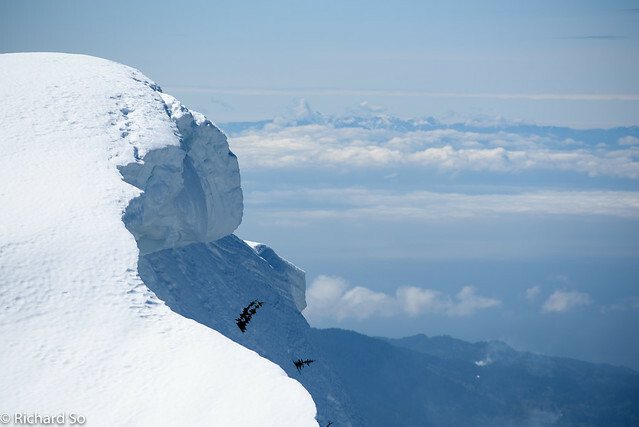 Beware of crevasses and unstable snow conditions. I hear some of the snow here is just covering up the bales of hay leftover from the 2010 Olympics. 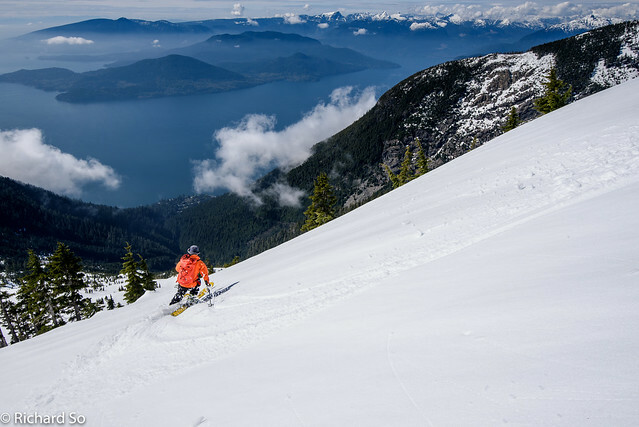 Each night, from 10pm-9am, the Cypress staff take great care to ensure your safety here, by conducting avalanche control and meticulously grooming it. Thanks for keeping us safe, Cypress staff. 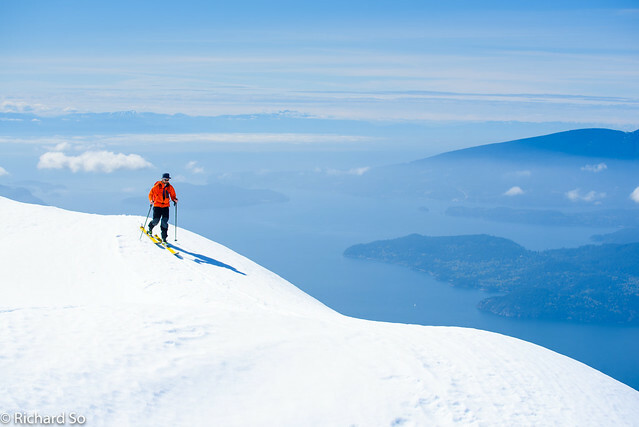 I thought about trying to start at 7am and then going around Hollyburn Mountain and up Strachan and down Christmas Gully with better skiing if the conditions are good. Today would have been frozen avalanche debris in the shade. 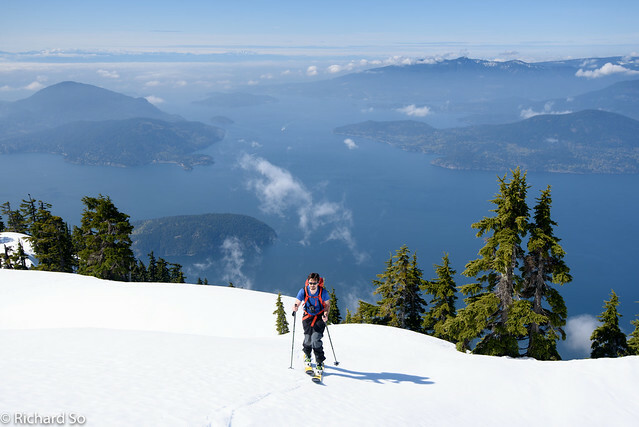 The winter route is marked by poles, goes along the edge of Yew Lake and then up switchbacks on a south facing slope and through the forest to intersect the Howe Sound Crest trail. I had to take off my skis a few times for some short bare patches. 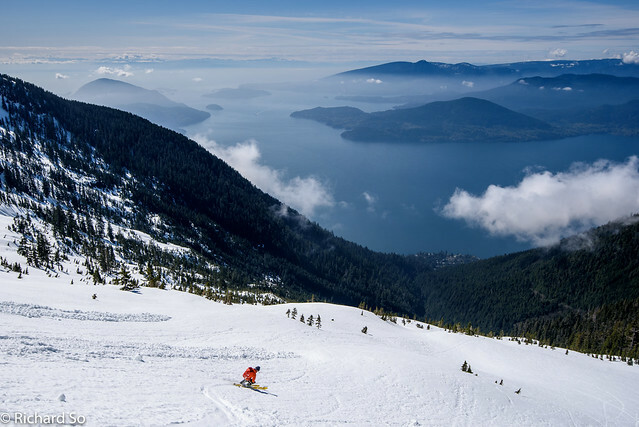 Once the ski area is closed (April 17 this year), it would be better to continue up the bottom of Horizon and then across the bottom of Top Gun for more snow coverage. 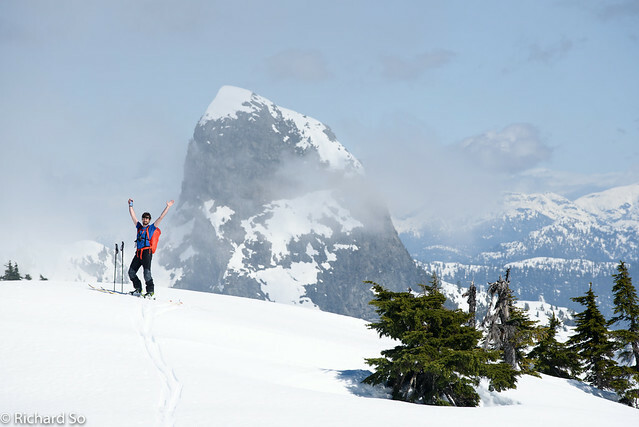 We contoured across the west side of Strachan, crossing a few creeks and old avalanche debris, towards the meadows on the north side of Strachan, about an hour at our leisurely pace. 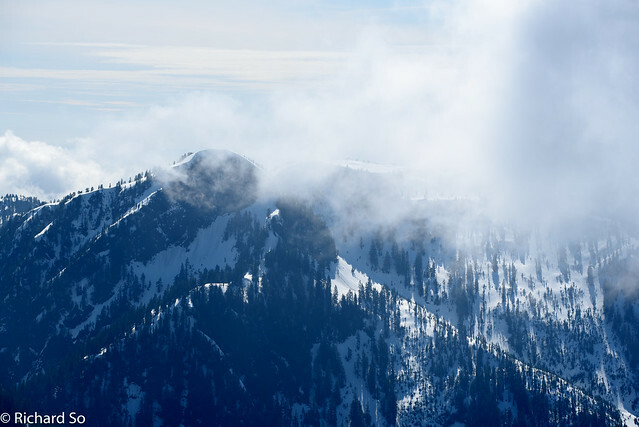 The route then climbs northwest to gain the forested ridge running north to St. Marks. The trees are nice and open here. We roughly followed the trail markers but you can basically head north. The snow was soft and wet in the forest. My skins were getting soaked and covered in wet pine needles. 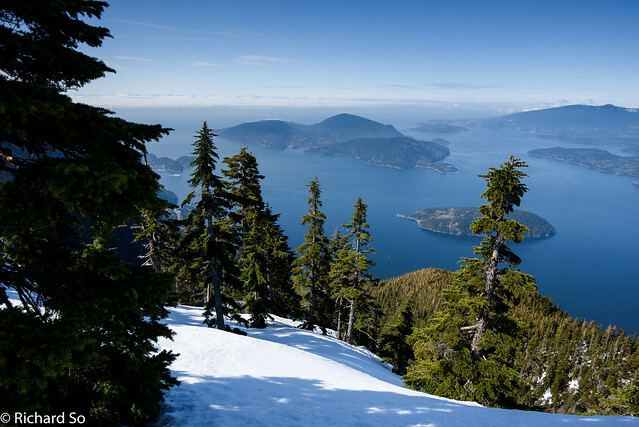 We took a break to enjoy the first views of Howe Sound from St. Marks summit, 2 hours into the tour. We took the skins off and descended north to the col between St. Marks and Unnecessary Mountain. 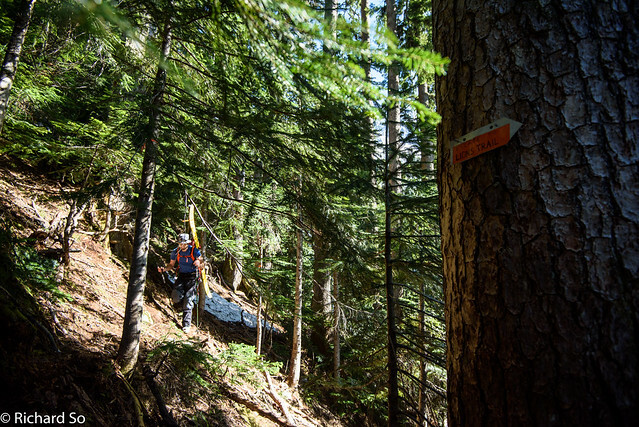 We stayed on the right side of the ridge crest, mostly contouring through the trees to reach the col, marked by a sign saying "Improved trail ends here." 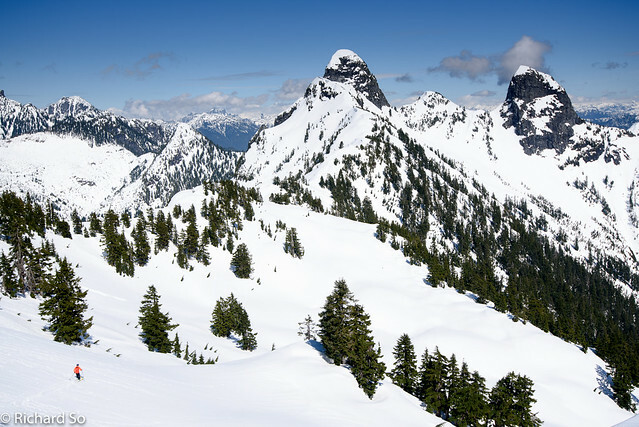 A short 200m climb through the open forest leads into the open ridge crest south of Unnecessary Mountain. 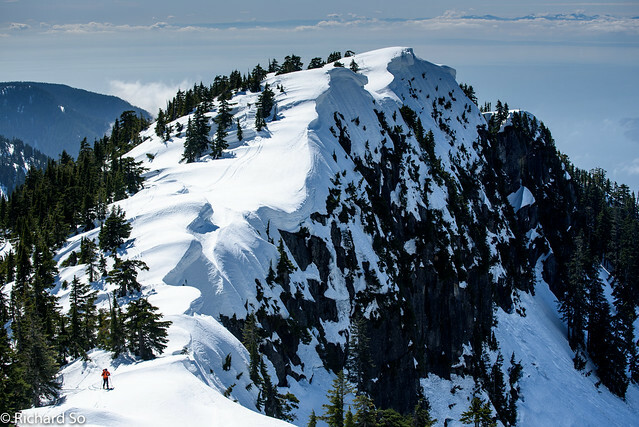 Travel can be tricky here in the winter, with large cornices on the left of the ridge, with cliffs below. When in doubt, stay to the right. The trickiest part was a short sidestep down north of Unnecessary South, with some wind features and sloppy snow to deal with. Some clouds started to roll through, with a light easterly wind. We bypassed the north summit of Unnecessary Mountain, with a descending traverse into the bowl on the east side. It was 1:45pm and the east facing slope had been baking in the sun. It was easy to set off slow-moving wet slides on this slope as we traversed towards the Lions, but it's short and not very steep with no exposure below. On top of St. Marks. Now I just need to find a James and David to go beyond the Lions. More forest travel. There's quite a bit of forest travel, but it's all nicely spaced trees. From the low point between Unnecessary and the West Lion, we continued a short distance to the north. The snow was already getting moist and slushy on the west aspect, so I decided not to ski the steeper slopes off the ridge crest. We sat on the ridge crest with nobody else around, a stark contrast to the usual busy scene of hikers here on a summer weekend. I figured the snow wasn't going to get much softer, so we enjoyed the views of the ocean. After finishing my calzone, some chocolate and chips and a beer (11th essential of any North Shore ski trip), we started skiing down into the open bowl below. I was able to easily ski cut the top 15cm. The top layer was moist, would slowly slide on slopes steeper than 30 degrees and slowly entrain the material below. As long as you didn't get caught in it, it was ok. I watched the wet snow slide down the slope, almost like watching water boil. 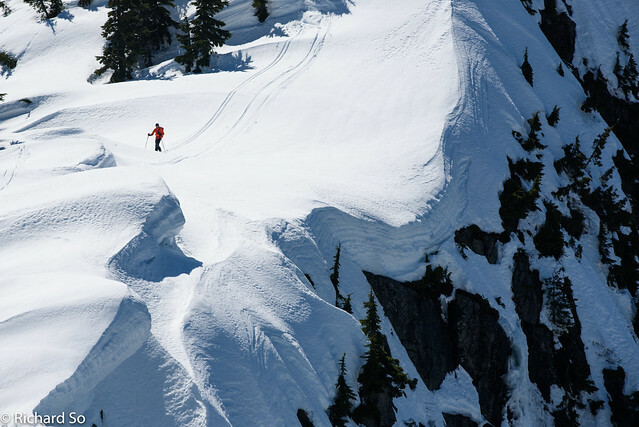 When the snow stopped moving, I skied down the firmer bed surface, with surprisingly good turns. The angle eases off below the ridge and there were no more wet slides, just some fun slurpee turns. 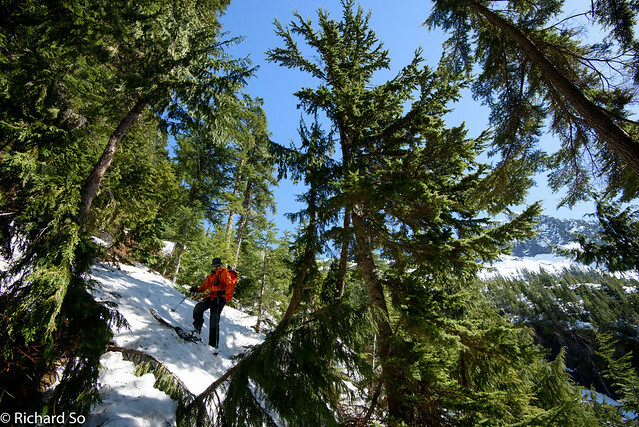 The slope funnels into an avalanche gully, so we traversed right into the forest, picking up the diamond-shaped trail markers in the old growth. 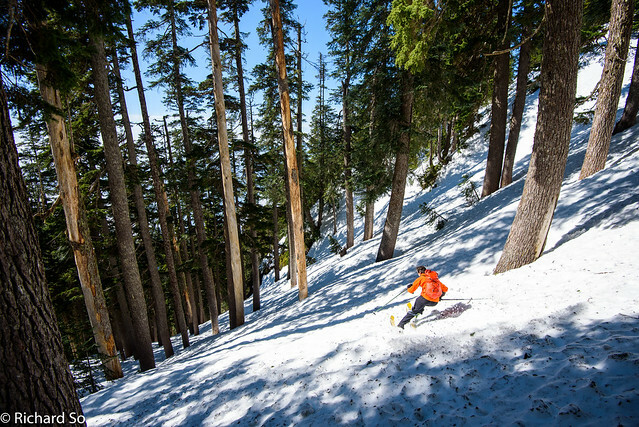 The skiing was awesome here, with fun soft turns ripping through the wide spaced trees. Down and into the forest on the right. 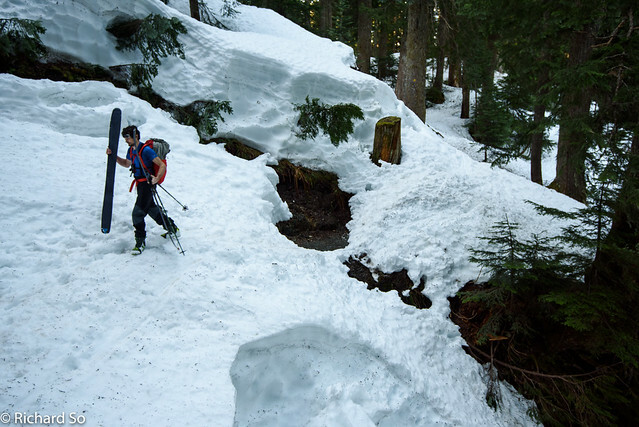 Going straight down leads into an avalanche gully, likely with a creek in the middle near the bottom. We were able to ski down to 975m. I think I ended up slightly left of the trail. Skis went on the pack and I started a descending traverse to pick up the trail, as shown on my GPS. I think we were too low and instead picked up the "Escape to Lions Trail" route. Clearly somebody has gone through the effort to helping out lost and confused skiers like us. 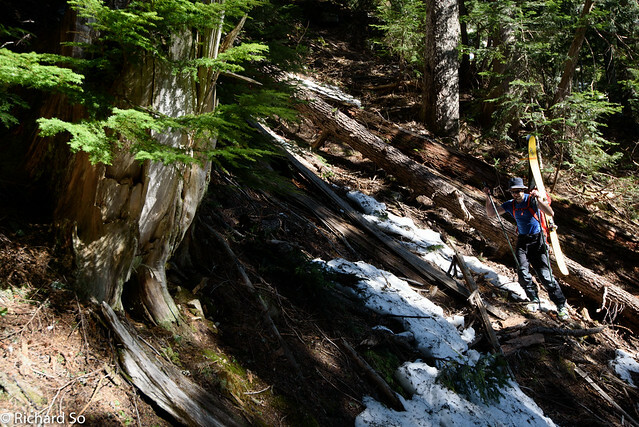 The Binkert/Lions trail has seen some major windstorms in the past couple winters. 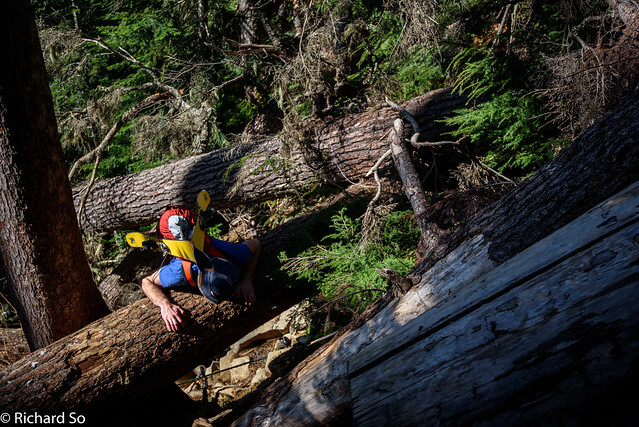 It's been a long time since I've hiked it, but I was surprised by the amount of large blowdown between 975m and 900m. Travel was slow and I was happy not to be doing this by headlamp. 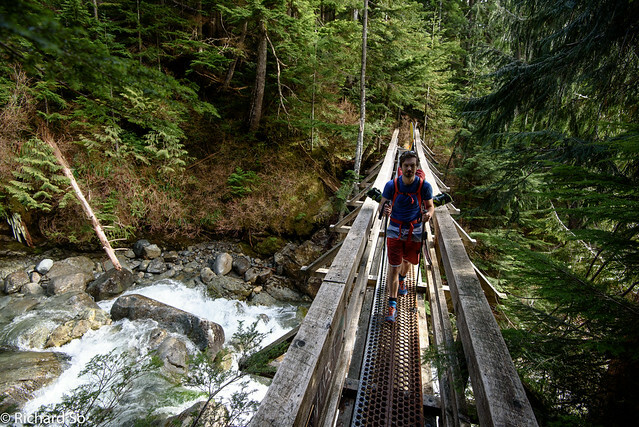 I was also happy to have the trail shoes as we plodded down the Harvey Creek roads down to Lions Bay. We were down at 5:30pm, 8 hours at a casual pace in ok travel conditions. And to top off the ski tour, Jen gave us a ride back to my car at Caufield, thanks! 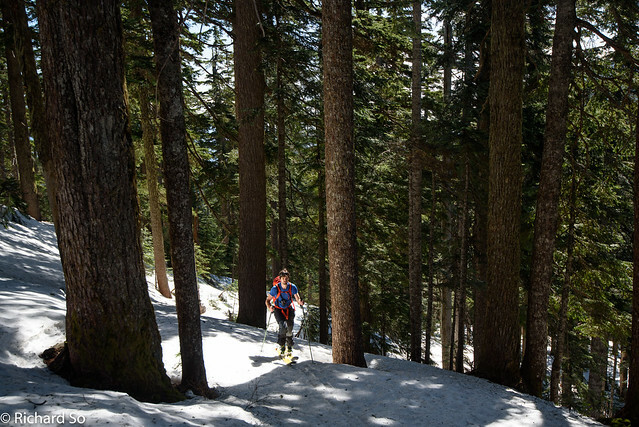 The snow is receding quickly in the forest at the lower elevations but this ski tour should still be in a good shape for a few more weeks. Even with the late start from Cypress, it's a very reasonable tour with some excellent views and fun ridgetop travel. 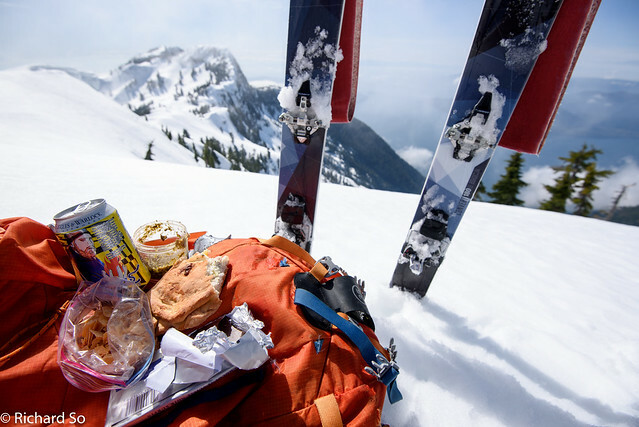 I brought my ski crampons, but they ended up staying in my pack the entire time. 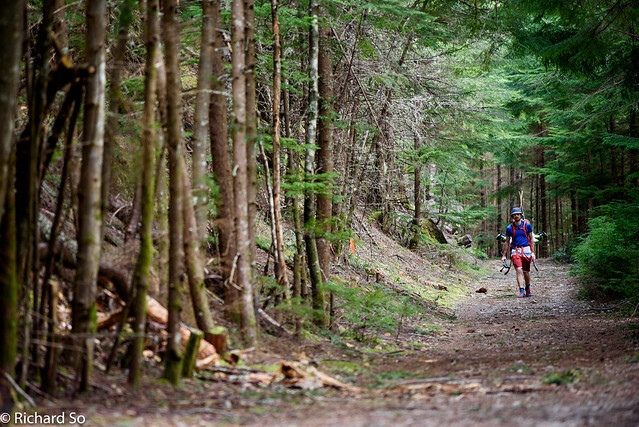 But, bring your your trail shoes! It's the difference between a nice walk at the end of the day and a toe-bashing grind down the old roads. And they are convenient beer can protectors. The conclusion to another successful North Shore Ski and Beer meeting! Great write-up. Next weekend perhaps. Thanks Cyrus! Hope you you good snow conditions for it! nice account rich! The first time i did this we more or less followed your described route but snagged perfect mid march conditions with an added run off n side of st marks it was so nice. 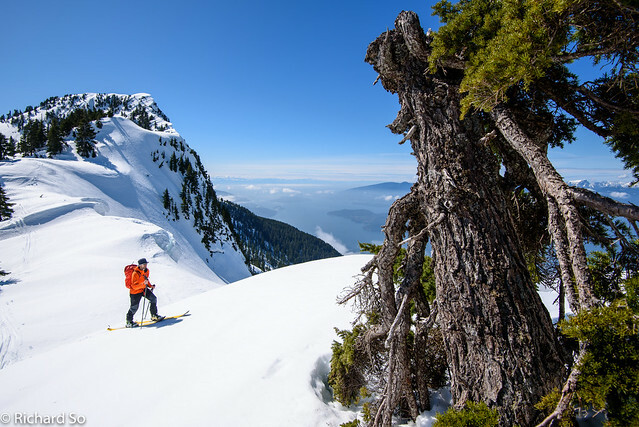 Second time in late march it was going OFF so we went for the fun route of holyburn, strachan w west face then st marks, followed by a tour a few hundred feet below top of unnecessary to cross the S Bowl at head of cap drainage and pop up-between the lions. Onward from there with some unreal n side turns aand a couple more bumps ultimately coming around the n side of harvey and thence to the trail and road network down to LB -highly recomended. Thanks! Your two trips sound great! The terrain right below St Mark's does look good with some nice looking old growth. Gotta check that out next time. We knew that the east/south traverse around the Lions would be really sloppy, so we saved that one for another time with better snow conditions. Did you go all the way to Brunswick on that trip when you say north side of Harvey? Or do you mean down Enchantment Pass?